For a long time now, conservative speakers have been being blocked by left-wing students and protestors. At UC Berkeley, a leftist seminary, things have spilled over into fascism and violence. You can review some photos of the violence, vandalism and rioting in this post from the Daily Signal. A female Donald Trump supporter was pepper-sprayed on Wednesday night by an anti-Trump protester while she was giving an on-camera interview at the University of California, Berkeley. Within seconds of that comment, someone wearing black gloves came over and pepper-sprayed Robles in the face and then quickly ran away. It is not completely clear why Robles was targeted, but she was wearing a red “Make Bitcoin Great Again” hat that resembled Trump’s “Make America Great Again” campaign hat as protests broke out to oppose a Trump supporter scheduled to speak on campus. Watch that. And think carefully about what Democrats are really like. How different is the typical Democrat that you know from the one who attacked a defenseless woman who was merely speaking words that the attacker did not like? This is the result of leftist seminaries and the leftist mainstream media and leftist Hollywood teaching impressionable young people to hate others instead of understanding them. The use of violence in the pursuit of political aims is the very definition of terrorism. And while it probably would be too much to treat these half-baked campus radicals with the seriousness applied to al-Qaeda or the Islamic State, the crimes committed in this and related episodes are serious and demand to be treated seriously. 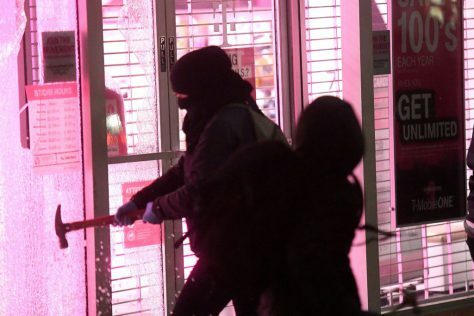 Political violence has social implications far beyond those of ordinary crime — we are not talking here about local thugs knocking over a 7-Eleven in Oakland. Domestic terrorism. That’s what the left perpetrated, and is now covering up, in California. The article notes that only one person was arrested, and that’s not surprising, since the Democrats in power are doing nothing whatsoever to fix the problems. This is what Democrats believe, from bottom right to the top. So why would they punish people they agree with? […][T]he new violent nature of these protests prompts a discussion over whether or not the school should be a recipient of federal funds. Videos have surfaced of a crowd of protestors beating a man unconscious and lighting a massive fire, which led to the cancellation of Yiannopoulos’ speaking engagement by the university. Yet as of last night, campus police remained minimally involved in containing the riots, with the police chief saying she was not aware of any arrests made. Fortunately, there may be a way to reverse the indoctrination in hate that young people are receiving – namely, cutting off the flow of taxpayer money to the leftist seminaries. Indeed, American taxpayers should be well aware of where their money is going. UC Berkeley is a public institution that receives federal dollars, yet it appears to allow violence, censorship, and holds contempt for the Constitution and the rule of law. The response to Trump’s tweet from Lt. Gov. Gavin Newsom, a radical leftist, was to pretend to be shocked that anyone would punish the leftist leaders for manufacturing domestic terrorists with taxpayer money. They are so entitled, that they cannot imagine that they are committing fraud by taking taxpayer money, and turning out little brainwashed fascists. Now the secular left will be very unhappy with the flow of funds they use for indoctrinating children being cut off. But if we want to stop future crimes and future acts of domestic terrorism, then we should serious about forcing the leftist seminaries to expose their little psychopaths-in-training to critical thinking and a diversity of viewpoints. Before it’s too late. These people are vile thugs, part of an international terrorist movement responsible for all kinds of crimes in Europe. Trump needs to lock them up, or worse.